Happy Wednesday and One Room Challenge update day! 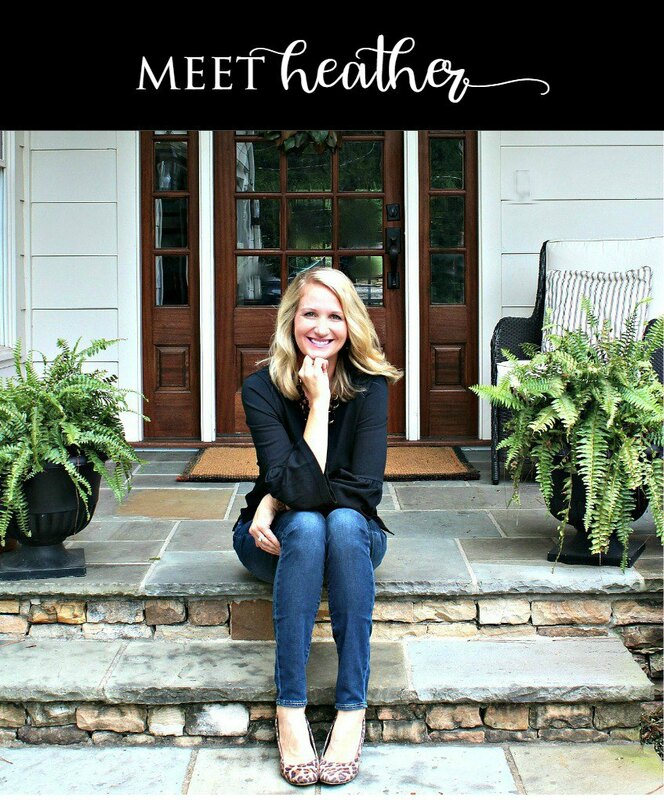 If you are following along then you know I didn’t have much to report last week and I am busy working on a back porch update and planning our Derby party, so there was no week #3 update. I know, I know. How can we all possibly live with the suspense?!?! The good news is that there has been some progress and I will share some sneak peaks with you today. But only tiny peaks because I really want you to stick around for the big reveal in just TWO SHORT WEEKS! 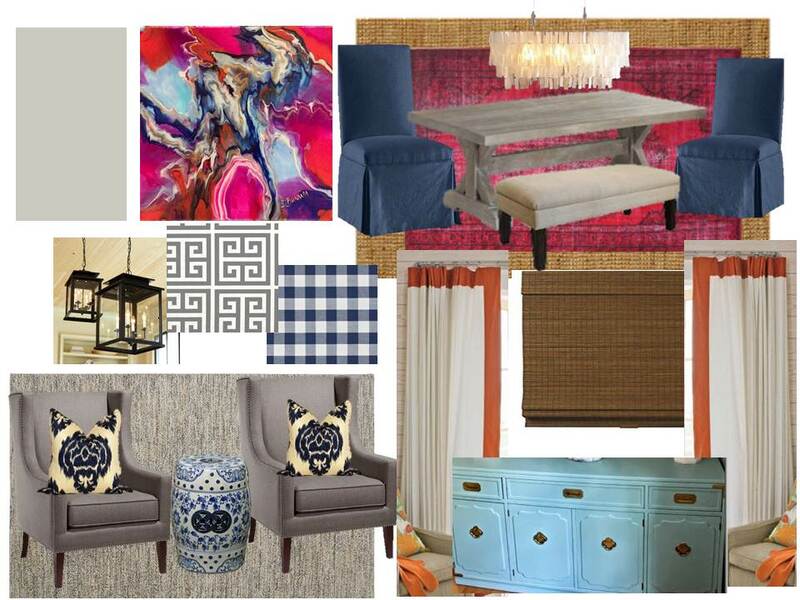 As a reminder, here is the inspiration board for the dining/sitting room combo. In my week two update, I shared the Top Ten To-Do’s for the space and I am thrilled to report that five have been knocked off the list! OK, here we go! 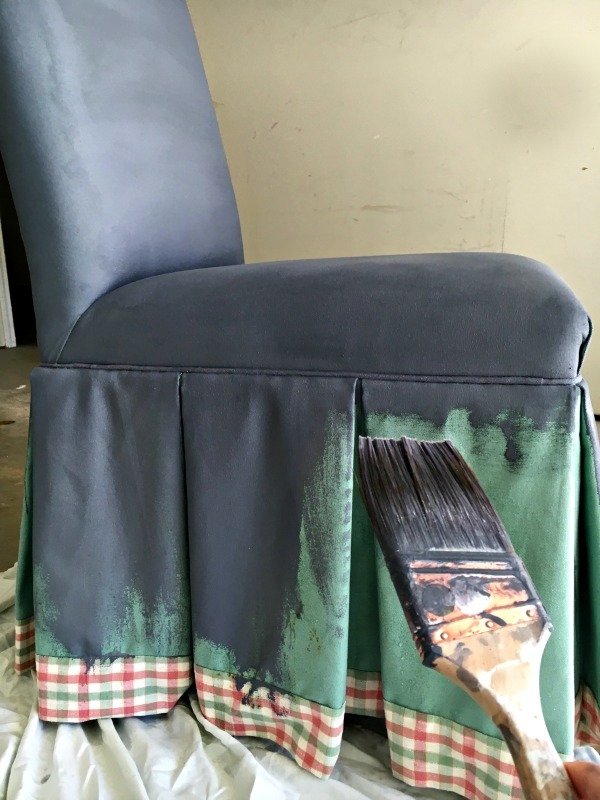 NEWS FLASH- YOU CAN PAINT UPHOLSTERED CHAIRS. Sure, you may have seen this on Pinterest before but maybe you had your doubts. I am here to tell you that it can be done, and it is easier than you think! I will definitely be sharing a full tutorial for you soon. I can’t believe these are the same chairs now! THREE: Recover bench and chairs. My original plan was to recover the bench with a vinyl tablecloth (see above reference to stains). But since I have a major stash of fabric (I prefer to think of it has collecting vs. hoarding), I decided free was the way to go so used some fabric I had on hand to give it a new look. 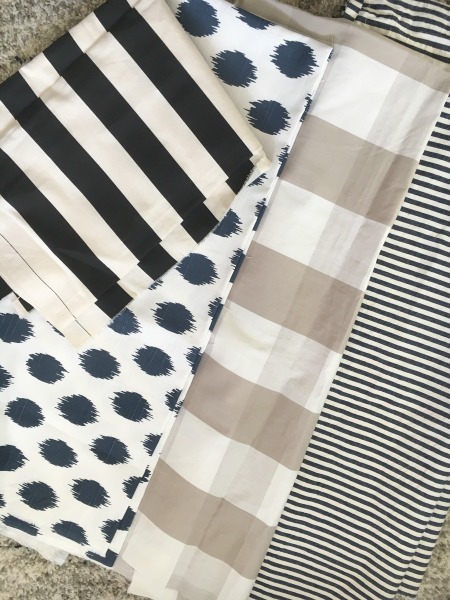 I think this striped navy gives the room a fun coastal vibe and you know I am a sucker for all things navy. And striped. Think the Hampton meets Atlanta? 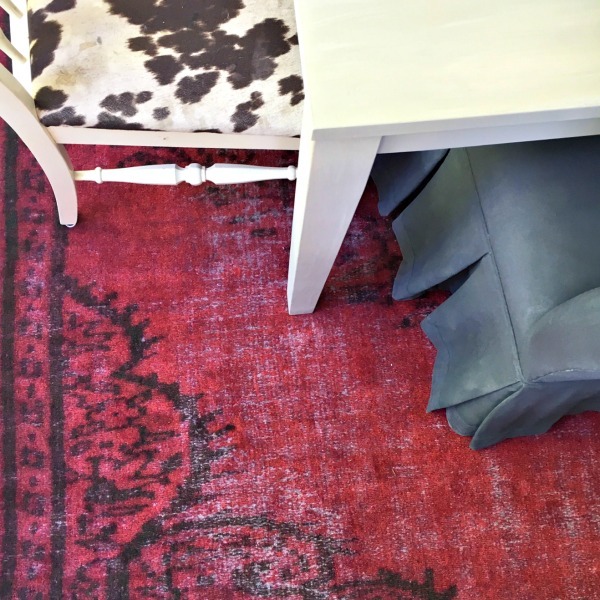 The chairs are going to stay with the cow print because I kinda love the way the pattern mixes with the rug now! Y’all. This one is BIG! I mean… literally… really…BIG. At first when I created my inspiration board, I thought we might actually splurge on some new art. Like actually pretend we are mature adults and have a real piece of art. But since we still haven’t landed on something we absolutely LOVE and I didn’t want to rush it, I came up with the next best thing. 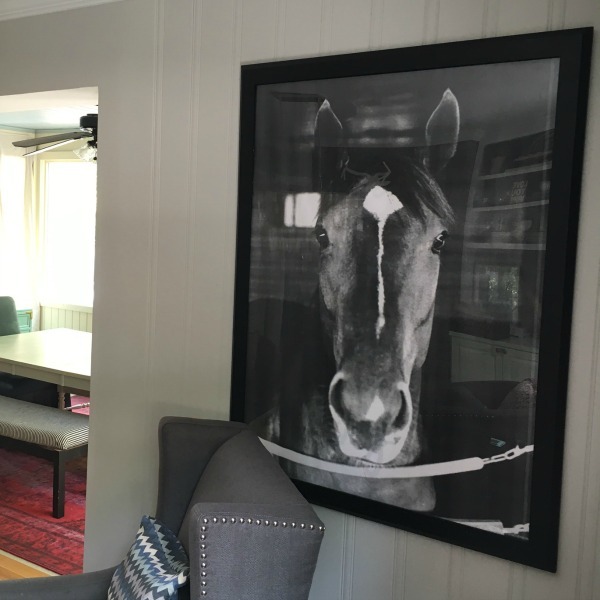 A three foot by four foot black and white picture of a horse. Secretariat to be exact. And a total of $9 spent. Although it is definitely inspired by our upcoming Kentucky Derby party, I have a feeling it will be around much, much longer. I absolutely LOVE the way it turned out! I cannot believe I actually have a painted dining room table. Y’all, I have been contemplating painting this table for probably two years. THIS is why I love the One Room Challenge. Less contemplating, more DOING. I knew it was going to be a good project when this cute paint deck showed up in the mail to choose the colors for the paint. I loved working with Velvet Finishes and will definitely be back soon to share the full tutorial on how I achieved this “driftwood finish”. The best part is that I knocked it out in about 1.5 hours. So so so easy. We are just over half way through the list with only two weeks to go. 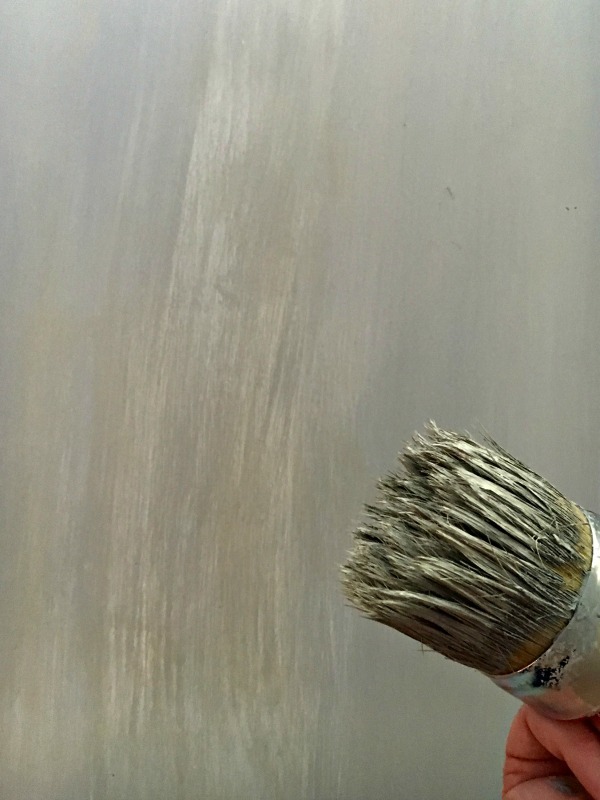 The painter arrives today to paint the dining room- I had to outsource this time since there is absolutely way too much windows and trim to deal. And I MUST figure out a solution for the windows. (any ideas?!?!?) Then it’s just light fixtures and stools. Oh and then accessorizing which is definitely the fun part! All right, stay tuned for a final update next week before the big reveal in two weeks! As always- thanks to Linda at Calling it Home for hosting the One Room Challenge. Be sure to click over to see all of the updates this week! Loveeee the color combo and the big art! Totally feel you on being a “grown up”- all of my art I was either lucky enough to inherit or is a thrifty find. One of these days we’ll find the right piece to invest in, but for now I’m happy rocking the thrifty stuff. Can’t wait to see your reveal! Ooh, lots of good parts and pieces there! Thanks Emily! One more week to go, woooooooooo weeeeeee! Feeling weepy over your Secretariat photo. I adored that horse, sort of how I felt about Barbaro many years later. I like the quirkiness of his being in your dining room and the stark aspect of the black/white pic. Well done. Aw, so sweet! I am seriously obsessing over Secretariat hanging out with us every day! Thanks! 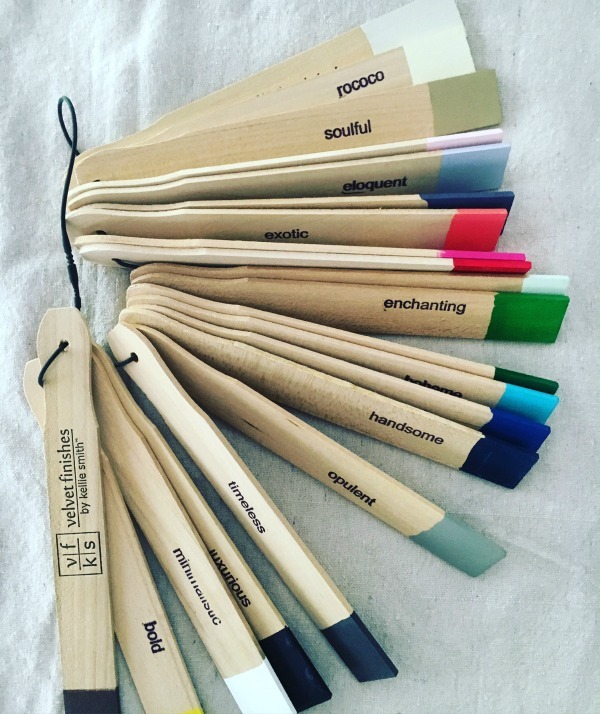 I had heard about painting certain fabrics from Jenny Komenda – Little Green Notebook. I was always afraid to try it so thanks for the heads up. Love the rug, too. Yep! I was pleasantly surprised. Of course, I had nothing to lose since these chairs were old and not my style. I certainly wouldn’t want to try it on a family heirloom but it certainly can help old furniture get a second life! Aw, thanks for cheering me along! And no need to have FOMO- this is INTENSE girl. ha. Looks beautiful. The chairs turned out gorgeous. Thanks! I still CANNOT believe how well they turned out painted! The power of paint! Heather, it’s coming along beautifully! Where did you find that SPECTACULAR art of Secretariat? So enjoy all of your wonderful creative inexpensive ideas for great new looks!! !